ExcelPipe is here, and has many new time-saving features to help you work smarter. Retaining last access date now works in Search/Replace mode. As always, ExcelPipe will read filters from ALL old versions without any changes being required. Fixed error on closing running process before end. Added results of Data Sources search/replace to the Hyperlink report. Updated ribbon to Office style. New! Data Sources can now be updated (Office 2016+). when no ExcelPipe job is running. Added cleared error messages for EasyPattern and Perl Regex errors. Added more error logging for troubleshooting problems with .xls documents. Added the current filename to error reporting. Fixed error with non-recognized languages. New warning display if MS Excel is currently running, with a button kill it. Rebuild to remove Look In list not showing correct values. Fixed SaveAs issue in evaluation version. Fixed handling of updates to Pivot Table caches. Fixed loading of highlight color data from Import file. Updated button enable/disable for grid. more DB connection string and connection string filenames are replaced. Fixed synchronization bug that caused ExcelPipe to hang. Now can handle search and replace inside embedded tables. 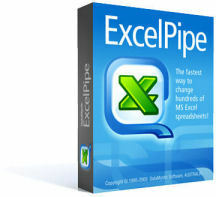 (x32/x64) between ExcelPipe and Microsoft Excel. Fixed search terms not found. Fixed doubling of search terms every time ExcelPipe is closed. highlight color of yellow if the highlight color column is missing. Now supports Open Document Calc file type .ods. standard 56 colors, or the actual color used with Excel 2007 and 2010. DAO, OLEDB and ODBC database queries, Web queries etc. Highlight color can now be set (to Excel's range of 56 standard colors). settings to show or hide Microsoft Excel. Fixed protection passwords not working. Added .xlsx to list of default file types - not sure how this was missed! Now handles Unprotecting and Reprotecting sheets with blank passwords. Now handles search-only mode on protected sheets. open, preventing #NAME? errors after the search/replace has occurred. Fixed search grid being disabled. protection type under Office 2007/2010. Search-Only mode now works in protected sheets. not be terminated when opening a large file. OLE and DDE links are now included in the Link Report. Limit to the number of import errors shown. Fixed issue with read-only detection of Unicode filenames. Fixed more issues with SharePoint and File Locking. Now detects Show Repairs dialog for corrupted documents, and closes it. did not re-trigger after the first failure of Microsoft Excel. you are using Excel 2007 or later. Excel 2003 and earlier handle this fine. this prevents errors with Excel 2007 that cannot be handled automatically. Fixed prompt on replace displaying even non-matching terms. text. Makes for far easier searching. Protected documents are now not flagged as having the search text. 255 characters do not get processed. Microsoft Excel now kept visible better if 'Keep Visible' option checked. File associations now just for .xls and .xlsx files. Now opens .XLA files correctly (containing code modules only). Now typing 'excelpipe' in Windows' Run dialog will start ExcelPipe. Improved handling of Microsoft Excel restarts. Now closes all open documents prior to processing each file. sheets it can't process and continues with the rest. 'Microsoft Excel Update Links' dialog now suppressed. Improved the internal method by which the password is used for Code Modules. Fixed problem where two sets of changes were made. Fixed bug in Code Module search. Now can search/replace Sheet Names (e.g. Sheet1, Sheet2, Sheet3). Fixed title of Cancel button in status window. as it is much faster and more capable with text files. Now offers 'Yes to All' for fixing longer search phrases. Added ability to search/replace inside Code Modules. Added option to keep Microsoft Excel visible while running to aid debugging. prior to the processing thread finishing. Fixed processing error with hidden rows/columns. Now makes changes in formulae properly. New link report for reporting hyperlinks found or changed. Now can search and replace inside hidden rows and columns. Better reporting of the number of cells actually changed. Now handles unprotect passwords in conjunction with OLE links properly. New option to specify the unprotect password for sheets and workbooks. easy (note: does not work for all search types). 255 characters, which Microsoft Excel doesn't support. while showing the 'Cancel Job' confirmation window. Fixed bug with Microsoft Excel being terminated at the wrong time. Fixed Match Case and Match Entire Cell settings not being retained. Office 2007 file extension of .XLS* now supported. supported on older versions of Excel. Properties, Links (OLE/DDE), Chart Titles and Defined Names. New option to Allow Alerts from Microsoft Excel. occurring when the settings have been changed. Fixed bug where MS Word was restarted, not MS Excel. Was only finding in Values, now finds in Formulae as well. Determination of whether a replacement occurred is now correct. Removed the 'file exists' check. documents. This helps to eliminate Microsoft Excel errors. unresponsive for a given number of seconds. New option to specify the path to the Microsoft Excel executable (.exe) file. Fixed error with 'Search' button causing a Replace. Fixed error with 'Cells' search location not working. Now can replace inside Chart Titles. Now can replace inside Defined Names. it can lead to document corruption. lists with WordPipe and PowerPointPipe. Read-Only files are now added to the files tab. Better detection of changes being made or not. Automatically extends the grid when you Tab or Down Arrow past the end. Now handles European installations of Excel. Now includes text files for you to play with. suppresses warning messages for intervention-free execution. Fixed problem with password-protected files stopping the processing. Now can perform Unicode search and replace. New Search-Only function, very useful to locate matches. New-style Tips of the Day dialog. New User Interface for easier editing, with row copying and moving. Double-clicking on filenames in the results window now opens the file. Double-clicking on the start folder now opens it in Explorer. Now can search and replace inside the header and footer of each worksheet. New status window options to copy the log to the clipboard. Now displays the number of changes made to each document. Now disables many of MS Excel's alert dialog boxes. Now can search inside shapes. Now can search inside hyperlink addresses. Interface now takes advantage of WordPipe-style interface improvements. Removed prompting if the search string is not found.